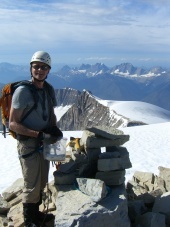 At CIRRUS Alpine Guides we are very proud of our level of customer satisfaction. The quotes below are a small sample of responses that we have received from our guests over the years. I've climbed with Mark on five trips and three of these trips were to the Bugaboos. Mark's two day Bugaboo trips are a great idea. If you're busy (family,work,and other commitments) then the two day trip is the way to go. 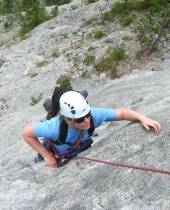 With the 2 day trips you get in a lot of climbing in a short amount of time. You're not hauling in 5-6 days worth of food and extra gear. You go into the Bugs "light and fast"! I have climbed with Mark for 10 years now and he has safely introduced me to ice climbing,rock climbing and mountaineering. He is a great teacher and I always feel safe in the mountains with him. His technical ability and knowledge is unparalleled. One of my personal goals is to climb as many of the Rockies’ 11’000’s as I can and I am up to 13 so far. 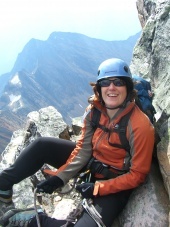 My favorite trip to date has been our 5 day trip to climb the Lyell’s and Mt Forbes. Climbing the five 11000’ peaks of the Lyell’s in a one day traverse is one of the highlights of my climbing life to date. Two days later we were on top of Mt Forbes, which is the highest peak in Banff Park. Aside from the climbing, the campsites for the Lyells and Mt Forbes are some of the most beautiful that I have ever stayed at. I always look forward to my trips with Mark and excellent adventures we have had. Jeff Peterson Geologist, Calgary, AB. Every season I look forward to the trips I take with Mark. I know that I will challenge myself and improve my technical abilities while being highly entertained by Mark's many, many stories. Mark has made it possible to fulfill my dreams of climbing mountains through both mountaineering and ski touring and I have now been on top of the world on 4 different 11,000ers with many more to come. Mark's best features are you never do anything that is unsafe (he will turn you around when it is needed for safety) and he is ALWAYS patient and positive. One of the best trips was a 5 day ski tour in the Wapta glacier. Mark customized the trip to meet the group's (4 friends) skiing abilities so that it was challenging and rewarding for all. If you want to have some incredible memories - Mark's the one to help create them with you! My trips with Mark have always been a highlight of my season. 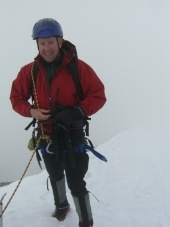 Whether it be mountaineering, climbing or ski touring Mark's got the knowledge, the skills and the stories. I look forward to my next adventure with him. Thanks Mark!" 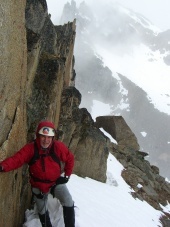 "I have been climbing with Mark as my guide numerous times over the last few years. He is great to get out with. The climbs have been well chosen for my abilities, i.e. an adrenaline rush without object terror. He allows me the thrill of testing me so that I feel I have done the climb, not just hauled up like a bundle of sticks. He has lots of stories and many of them are actually funny. This keeps the climbing interesting as you learn about other climbs he has done, skiing trips, other guides and their experiences, his life experiences. In a nutshell you trust him implicitly and feel you are in a circle of special friends. I highly recommend Mark as a guide. His skill level and experience would be difficult to match." 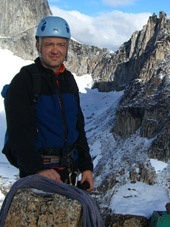 For any type of climbing or mountaineering activity in the Canadian Rockies or BC interior ranges, I would highly recommend Mark Stewart. When it comes to technical skill, local knowledge and leadership style, I have never climbed with anyone better in North America or Europe. In addition, his easy interpersonal manner will make any trip with Mark an enjoyable and rewarding experience".